In having the chance to talk to Anna Webber leading up to her performance at Café Resonance this past Monday, one of the things that struck out to me was her organized manner. Each email sent leading up to the recording session of our interview was quickly followed by a reply from Webber and a question about the specificity of the interview. In my experience with jazz musicians, systematically planning things out before they happen is not a common occurrence. Perhaps the tendency for jazz musicians to haphazardly live out their lives is due to the improvisational nature of the music they play; however, the genre also leaves room for a more precise approach to songwriting. Webber’s organizational approach to life is reflected in the meticulous way she composes her music. From a purely visual viewpoint, Webber and her ensemble of Matt Mitchell and John Hollenbeck are bound to pages and pages of music throughout their performance. This strategy allows the group to look at the big picture beforehand and cohesively transition from section to section truly exposing every possible combination of sound. The night began with Webber improvising alone on her tune “Impulse Purchase.” Her beautifully executed soft melodies were eventually accompanied by her pianist Matt Mitchell. A unique player, Mitchell’s fusion of chordal, melodic, and bass-line playing filled the space between Webber’s treble heavy Saxophone lines and John Hollenbeck’s textural drum execution. After communicating for a while the trio entered into one of their erratic, odd-meter grooves. It was the monster performance from Hollenbeck that brought these grooves to light. Hollenbeck was all over the place articulating the polyrhythmic devices all over the kit. Also the power behind the operation, Hollenbeck could be seen continuously yanking his bass drum closer to him as it was migrating away due to the immense force of his leg. The grooves were matched by spacey moments in a very unpredictable fashion. Webber’s compositional chops made everything flow very naturally, but the ups and downs were always planned very differently, never falling into a predictable format. The first piece acted well as an overture for the evening. The quiet beginning was contrasted by the heavy rhythmic ostinato of the end and the unpredictable path that the group took set the tone for the rest of the night. The next tune, “Binary,” was a glorious tune featuring a spectacular singing melody from Webber. “Binary” also managed to incorporate modern elements as quick hitting drum fills broke up the pulsing saxophone-based ballad. Webber’s musicality showed strong throughout the night as her clean saxophone playing only broke into the territory of screeching at the climaxes of the most intense songs making for maximal expression. She also added an entirely different timbre to the room by playing flute. The quick hitting tune “Meme” obtained a quirky aesthetic through the combination of Webber’s flute playing and Mitchell’s high frequency counterpoint. Second half highlights included the back and forth action of “Tug O’ War,” the flaring excitement of “Zig Zag,” and the reserved nature of “Simplify Simplify.” Each song had a personality of its own and the versatile playing capabilities of all of the musicians made every moment different from the last. Despite the music being tightly bound to the page, Webber finds true brilliance in her ability to let the music breathe. There are key moments where the ensemble is given huge spaces to communicate and improvise, which breaks up the heavily performed grooves and provides a nice level of contrast to the overall sonic experience. The pieces mix melodic content so well that the lines between what is improvised and written are completely blurred resulting in an extremely cohesive set. Also, the musicians are so familiar with each other that the music never really becomes hierarchical. Whenever Mitchell solos, each and every line spawns reaction and communication from Hollenbeck and his phrases trade back and forth with Webber, a nice dismissal of the traditional composed, improvised, composed format. Webber’s really got something here. Her last album, “Simple,” showcased her knack for composing really dynamic trio jazz. 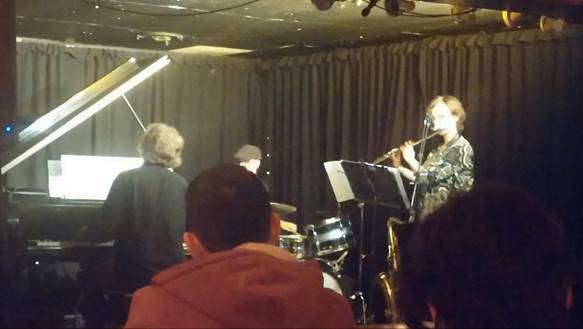 The night at Resonance struck as a very unpredictable and fascinating experience that pushed the modern-jazz envelop and the jazz listeners of CKUT should be prepared to invest in her next album due to release later this year. This entry was posted in Reviews and tagged Anna Webber, Jazz, John Hollenbeck, Matt Mitchell, Resonance on April 8, 2016 by librarian.